It’s regarded as the world’s ultimate race, but the cost of taking part in the Dakar runs to well in excess of £50,000 and that’s a lot of money in anyone’s book. A Dakar hopeful needs the best bike money can buy and right now that’s a customer version of KTM’s factory Rally bike, which will set you back a cool £25k. But there are other rallies to enter around the world and there are other bikes to race them on. One such bike is the AJP PR5 RR Rally. Priced at just £7750 this is an entry-level rally bike of the highest order. Based on AJP’s PR5 249cc single-cylinder liquid-cooled flagship enduro bike, it has been transformed from Enduro contender to rally weapon by British engineering company Rally Moto. The Cheltenham-based business have over a decade of rally experience and four decades of racing pedigree, so what they don’t know about preparing and racing bikes isn’t worth knowing. The attention to detail is impressive. From the factory-spec road book and navigation tower, complete with ICO (digital tripmeter) and CAP repeater (compass), to the beautifully-crafted bespoke fuel tank that doubles as a sub frame, this is a bike that has been built with racing in mind – and has already shown its credentials in a competitive environment. 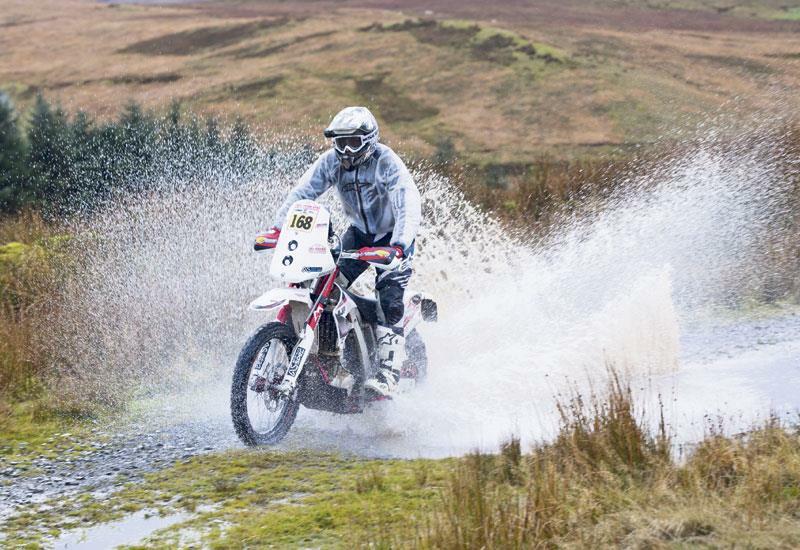 In October last year Rally Moto owner Mark Molineux raced the bike in a round of the Portuguese BAJA championship. From 160 starters, the vast majority of whom were running 450 enduro bikes, Molineux finished fifth over the 100-mile race. 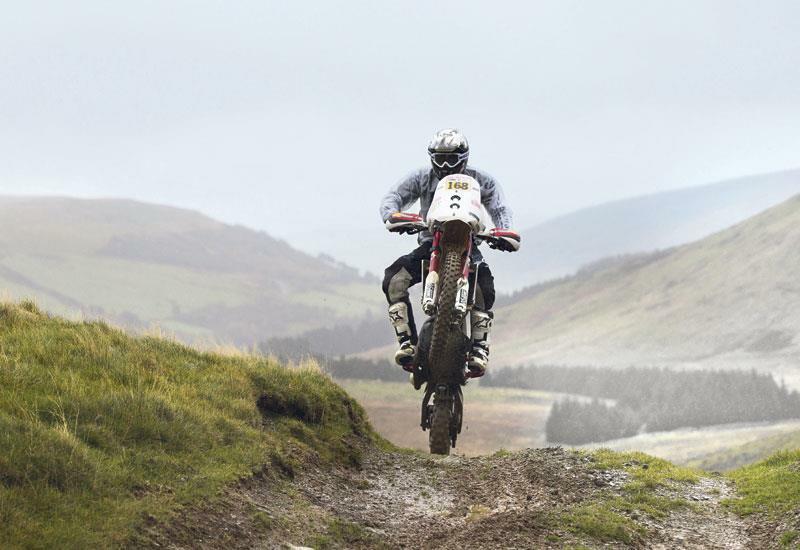 The setting of MCN’s first ride of the bike is a far cry from the dusty tracks of the Portuguese mountains or the South American desserts of the Dakar – we’re in Wales at the famous Sweet Lamb rally car testing venue just outside Aberystwyth. And as expected mid-winter on the Welsh coast is a wet and cold affair. Over the years I’ve been lucky enough to ride a number of genuine Dakar bikes, and while the experience has been one of the highlights of my career as a motorbike journalist, they are, thanks to their high seats, big power, tall gearing, barking exhaust notes and road book towers that prevent you seeing the front wheel, undeniably intimidating. For a mere mortal and non-Dakar competitor the AJP Rally is a breath of fresh air. Yes, it has a road book tower, which means you can’t see the front wheel, but that aside it’s a compact, usable and an instantly confidence-inspiring package. There’s still a serious bark from the tailor-made Doma exhaust, but it’s music to the ears rather than an acoustic sound track loud enough to make your lugholes bleed. One of the fundamental differences between an enduro bike and a rally bike is the amount of fuel it can carry. Enduro bikes generally carry around seven litres, which is more than enough to complete an enduro where there are regular opportunities to fill up. A full-blown Dakar bike, meanwhile, will hold up to 33 litres utilising two large front tanks and a rear tank. The AJP doesn’t have the same fuel- carrying capacity as a 450cc Dakar bike, but it still holds 17 litres, giving it an impressive range of over 180 miles in race conditions. The AJP, as standard, holds its fuel at the rear – there is no front fuel tank. This made it a simple exercise to increase its capacity and with some help from Rob Silver and Pete Farrelly at welding specialists Drayton Frames, the Rally Moto fabricated aluminium fuel tank and subframe is a true piece of engineering beauty. Capacity has increased by 9.5 litres, meaning the bike is now carrying close to an extra 9.5kg in weight but it hasn’t had the expected negative effects on the balance of the bike or handling. The Sachs rear shock has been re-sprung to compensate for the extra weight. I rode the bike with a full fuel tank and it feels stable at speed, with the front giving plenty of confidence. Weighing in at just 125kg (dry) in full rally spec, it turns, grips and changes direction more like a lightweight competition enduro bike than a fully laden rally campaigner. The bike comes into its own when you stand on the pegs and ride technical terrain thanks to its plush 50mm cartridge Marzocchi fork and neutral riding position. The 249cc single-cylinder engine produces around 27bhp as standard but this version boasts over 30bhp care of some basic head work and countless hours spent on the dyno mapping the fuelling to work with the Doma exhaust. It’s clearly not an overly powerful machine, but that’s not to say it isn’t fast. It’s a bike that loves to be revved and is fuelled perfectly for high speed riding. Unlike a 450, which is too much for an average rider, the AJP makes you feel like a Dakar god because you can actually ride it flat out and rev it mercilessly without complaint. The only downside to the perfect top end fuelling is that the bottom end is fluffy, which is a problem on slow speed technical trails, but can be ridden around with plenty of revs and a bit of clutch. When I was told about the bike and that its base was an AJP I questioned the credibility of the project. Although AJP have been around for years their earlier bikes didn’t necessarily have the best reputation and at only 250cc, it would struggle to live with 450s, surely? But this is a new era for AJP and quality has clearly improved. The lack of cubes make it more user-friendly and manageable for those wanting to improve. While the PR5 RR is essentially a prototype, it can be bought and is a great example of British engineering and know-how. Rally Moto have achieved a genuinely impressive package – improving and modifying the things that matter and leaving the things that don’t well alone. The balance between weight, power and usability is spot on and with over 3000 racing miles under its belt – so is the reliability.